Native to Europe and Asia. Introduced. Dry. Meadows, pastures, abandoned fields, roadsides, and disturbed areas. Full sun. Sandy and calcareous soils with short turf. This is a 12″ to 32″ tall, erect, perennial forb that rises on one to several stems from a dark, thick, branched, semi-woody taproot. The stems are branched, round, and hollow when young but soon becoming filled with pith. They are very slightly ribbed, more so near the bottom, and are densely covered with very short hairs. The leaves are alternate. Basal leaves are oval in outline and up to 12″ long. They are pinnately divided (once-pinnate) into several pairs of opposite leaflets and a terminal leaflet. The central axis (rachis) is short-hairy. The leaflets are broadly egg-shaped to almost round and are covered with short hairs. They are coarsely toothed and sometimes shallowly lobed. The terminal leaflet is often deeply lobed. 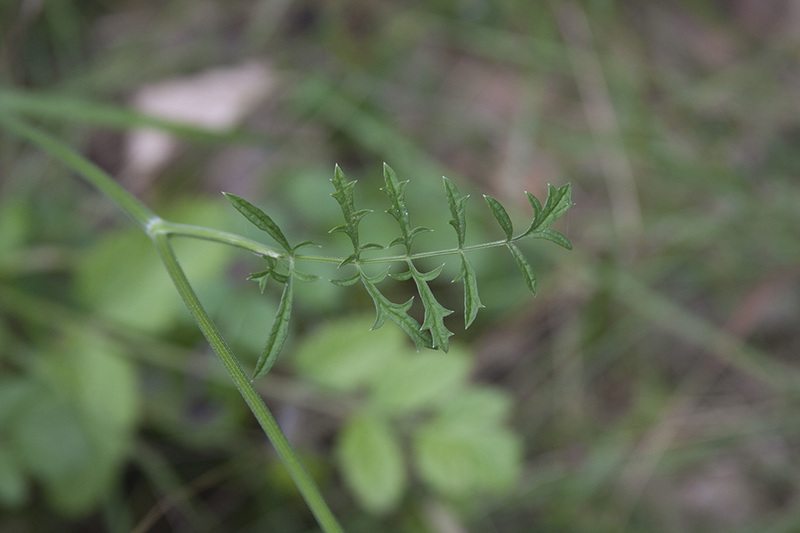 Lower stem leaves are similar but smaller, and become even smaller and less divided as they ascend the stem. Middle stem leaves are pinnately divided into several segments. Each segment is again pinnately divided (twice pinnate) into several narrow, pointed lobes. The lobes are often themselves lobed. Upper stem leaves are much smaller. They are once-pinnate with narrow, widely-separated leaflets. The leaf stalk forms a sheath at the base that wraps around the stem. Sometimes only the sheath is present and the sheath may have one or more small leaflets at the tip. The sheaths are noticeably grooved lengthwise (striate) and often turn purplish. 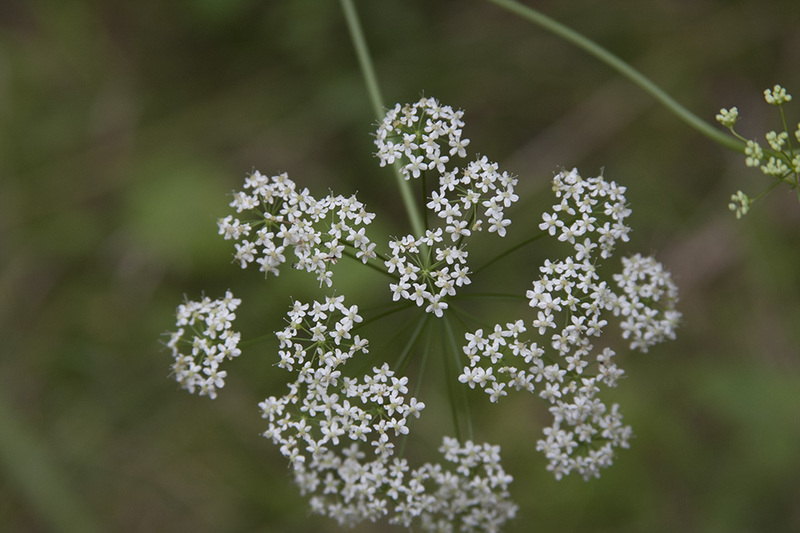 The inflorescence is a compound, umbrella-shaped cluster (umbel) at the end of the stem and each branch. 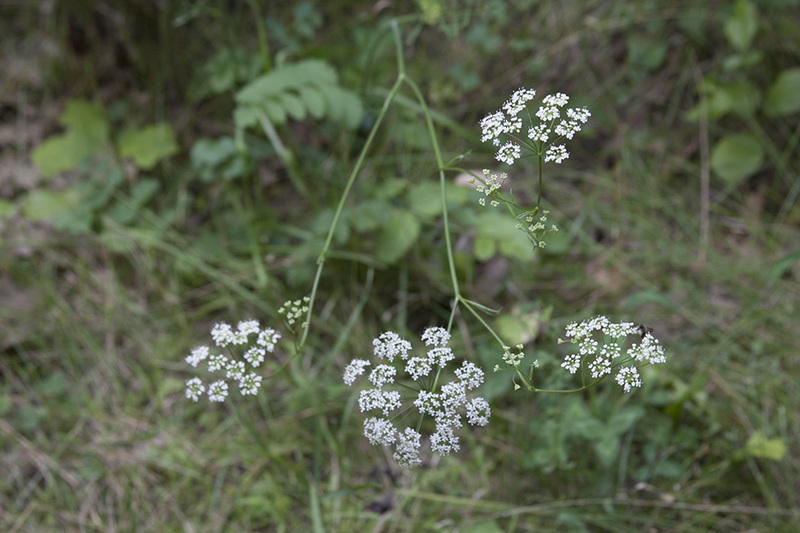 The umbel is stalked, round, more or less flat-topped, and ¾″ to 2″ in diameter. It has 8 to 20 slender branches (rays). The rays are ⅜″to 1¾″ long and hairless. At the end of each ray is a smaller, secondary umbel (umbellet). There are no modified leaves (bracts) at the base of the umbel and no secondary bracts (bracteoles) at the base of the umbellets. There are 6 to 20 individual flowers in each umbellet. The flowers are about 3 ⁄16″ (5 mm) wide. Inner flowers of the umbellet are symmetrical on every plane, like a starfish (actinomorphic). Outer flowers are sometimes symmetrical on only one plane (zygomorphic). There are sometimes 1 or more minute sepals, but usually there are none. There are 5 petals, 5 stamens, and 2 styles. The petals are white, sometimes tinged with pink, and inversely egg-shaped. The tip of each petal curves deeply inward, making the petal appear notched when viewed at a distance. The underside is hairy. The styles are white and straight. They spread out widely from the base like the arms of a TV antenna of the 1960s. They are shorter than the petals when in flower, elongating as the fruit develops, then dropping off when the fruit ripens. The fruit is dry, dark brown, broadly egg-shaped to elliptic, 1 ⁄16″ to ⅛″ (2 to 2.5 mm) long capsule containing 2 seeds. Sources: 2, 3, 4, 7, 22, 28, 29, 30. 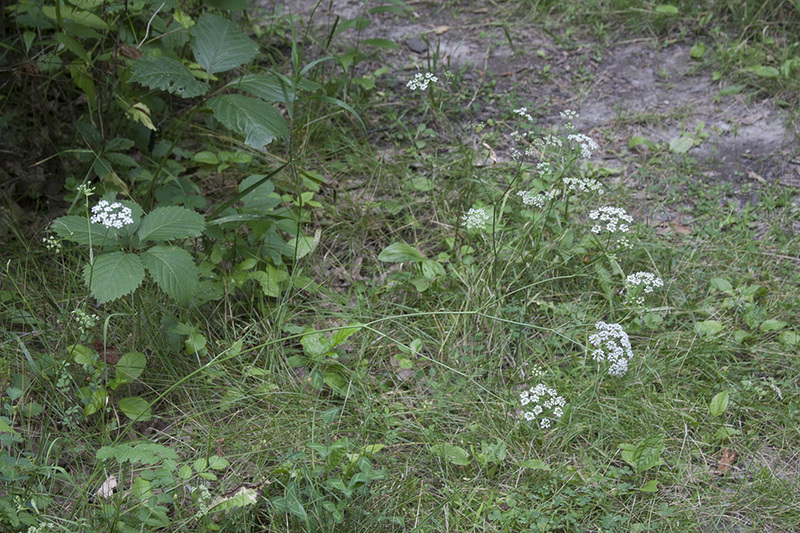 This is a Restricted invasive plant in Wisconsin. Minnesota does not list it as invasive. According to the Minnesota Department of Transportation, there are “several infestations” in Elm Creek Park Reserve. A small, often secondary bract within an inflorescence; a bract that is borne on a petiole instead of subtending it; bractlet.